The appointment of Richard Smout to the new post of Isle of Wight Heritage Services Manager brings with it some reorganisation of the authority's archive and research facilities. The new department incorporates Archaeology, previously under Planning, and takes over the 'local collection' of books and media from the Library Service. The museum service is unchanged, covering museum education, Newport Roman Villa, Museum of Island History, Cowes Maritime Museum, Dinosaur Isle and Cothey Bottom storage facility. Richard Smout will remain County Archivist, located at the Record office. The Local Collection is now housed at the Somerton premises under the stewardship of Sheila Caws. All these services were previously under the same Adult and Community Services Directorate. The major change is the inclusion of Archaeology, which was previously within the Planning Service. Archaeology plays an integral part in the planning process and this will be accommodated by one staff member now being located at Seaclose, responsible to the the Planning Dept. The remaining staff will continue under Ruth Waller at Clatterford House. The new structure constitutes the body that would occupy a proposed new building which is currently awaiting grant funding for a feasibility study. Should the ultimate application be successful, it will provide a modern one-stop facility for the public and meet today's standards for the archiving of documents and artefacts. It is, however, an ambitious aim and there is no guarantee the application will succeed. The service may still find itself having to provide improved archive facilities by other means. Whatever visitor access is provided, there is also a need to meet the growing public demand for Internet access to information and images. Between 1756 and 1771, the British government commissioned accurate map plans of the military camps at various locations in England. The collection is bound between hard-board covers and measures about 48 cm by 41 cm. Although designed to identify military encampments, they also show detail of general features within the area. The Island map is beautifully drawn and coloured. "Gunfield" is shown, as is "Hurst Stakes" and "West Mill". A building, most probably the tide mill on the marsh, is shown near where the Riverside Centre stands today. The military plans show the encampment at Newport in 1758 and 1759. The regiments are shown strung out in a long line from near Poleclose farm north easterly through Camp Hill as far as Horsebridge Hill. The pastureland of the south side of Parkhurst Forest round Kitbridge were the usual area for quartering regiments and the huge amount of military-related finds in this area support this (covered in a previous news item here). There are also several printed descriptions of the time mentioning setting up camp here. A "Fascine Battery" is shown in the middle of Worsley Road at Hunny hill and an entrenchment with triangular bastions is marked where the House of Industry would later be built. The regiments themselves were camped on the Island before heading out for duty in the British Empire or Europe, at the time of the great Seven Years' War. During their stay here they were involved in training, manoeuvres, parades and guard duty at various points around the Island. Planning development over the next two decades will be formulated under the 'Island Plan'. 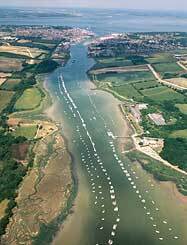 A key element is the 'Medina Valley Area Action Plan' which will guide future development between Cowes and Newport. The preservation of particular sites will be an integral consideration. The natural environment already has protection within designated areas but the importance of the historic environment is not yet recognised. Whilst there are recorded features along the river and its environs, few of these have ever been subject to proper archaeological analysis. The County Archaeology Service has now successfully bid for over £50,000 to carry out an historic environment assessment of the Medina Valley, as a background document to support the development plan. Work started on the project this summer with a desk-based assessment of the area's archaeological and historical sites in the Sites and Monuments Record. County Archaeologist, Ruth Waller, and SMR and Archaeological Projects Officer, Rebecca Loader, are now carrying out an archaeological survey recording remains within the intertidal zone. The results so far show that many possible prehistoric sites still survive. Radiocarbon dating of wooden structures and possible prehistoric hearths in the intertidal zone will be carried out by Ruth and Rebecca early in 2007. Other work will be contracted out. An underwater archaeological survey of the marine remains within the Cowes harbour area has already been undertaken by Hampshire and Wight Trust for Maritime Archaeology, with the report imminent. A geophysical survey of selected areas of the land base on either side of the river will be carried out by archaeological contractors in 2007. There are two known Roman sites and the survey will help to ascertain whether the site in Northwood really is an unknown Roman villa. The other site may show how the Romans used the river as a transport and industrial resource. The geophysical survey may also provide evidence of medieval and post medieval structures. There will also be palaeoenvironmental analysis of possible prehistoric hearth deposits, where evidence will be derived from the remains of once living organisms. A key item in this examination will be the Mesolithic occupation site at Werrar, identified in the 1930s. Little history exists for the banks of the Medina prior to the post medieval period. At present hardly anything is known about medieval activity. Quarr Abbey was a notable occupant on the eastern bank but, other than a hint of operations at Hurstake and Werrar, research has revealed nothing. Current history rather creates the impression the Medina came to life in the 17th century. Yet the presence of Newport Roman Villa by the river suggests it was an artery for human settlement from very early times. Roman activity further down the river seems natural and may have evolved from prehistoric occupation. It seems unlikely occupation ceased in the intervening centuries and hopefully later features will come to light. The ultimate aim of the historic environment assessment will be to ensure the permanent protection of some important sites and mark others for excavation prior to any development.